The susceptibility of the bicyclic nucleoside analogs (BCNAs), highly potent and selective inhibitors of varicella-zoster virus (VZV), to the enzymes involved in nucleoside/nucleobase catabolism has been investigated in comparison with the established anti-VZV agent (E)-5-(2-bromovinyl)-2′-deoxyuridine [BVDU; brivudine (Zostex)]. Whereas human and bacterial thymidine phosphorylases (TPases) efficiently converted BVDU to its antivirally inactive free base (E)-5-(2-bromovinyl)uracil (BVU), BCNAs showed no evidence of conversion to the free base in the presence of these enzymes. The lack of substrate affinity of TPase for the BCNAs could be rationalized by computer-assisted molecular modeling of the BCNAs in the TPase active site. Moreover, in contrast with BVU, which is a potent and selective inhibitor of dihydropyrimidine dehydrogenase (DPD) (50% inhibitory concentration; 10 μM in the presence of a 25 μM concentration of the natural substrate thymine), the free base (Cf 1381; 6-octyl-2,3-dihydrofuro[2,3-d]pyrimidin-2-one) of BCNA (Cf 1368; 3-(2′-deoxy-β-d-ribofuranosyl)-6-octyl-2,3-dihydrofuro[2,3-d]pyrimidin-2-one) and the free base Cf 2200 [6-(4-n-pentylphenyl)-2,3-dihydrofuro[2,3-d]pyrimidin-2-one] of BCNA (Cf 1743; 3-(2′-deoxy-β-d-ribofuranosyl)-6-(4-n-pentylphenyl)-2,3-dihydrofuro[2,3-d]pyrimidin-2-one) did not inhibit the DPD-catalyzed catabolic reaction of pyrimidine bases (i.e., thymine) and pyrimidine base analogs [i.e., 5-fluorouracil (FU)] at a concentration of 250 μM. Consequently, whereas BVU caused a dramatic rise of FU levels in FU-treated mice, the BCNAs did not affect FU levels in such mice. From our data it is evident that BCNAs represent highly stable anti-VZV compounds that are not susceptible to breakdown by nucleoside/nucleobase catabolic enzymes and are not expected to interfere with cellular catabolic processes such as those involved in FU catabolism. Recently, a novel class of bicyclic nucleoside analogs (BCNAs) has been discovered that is endowed with an exquisitely potent and selective inhibitory activity against varicella-zoster virus (VZV), the etiologic agent of chickenpox and shingles (McGuigan et al., 1999, 2000). The selectivity of these compounds is unprecedented in that they solely inhibit VZV infections but are completely inactive against other herpesviruses [herpes simplex virus type 1 (HSV-1) and 2, cytomegalovirus] and various other DNA and RNA viruses. 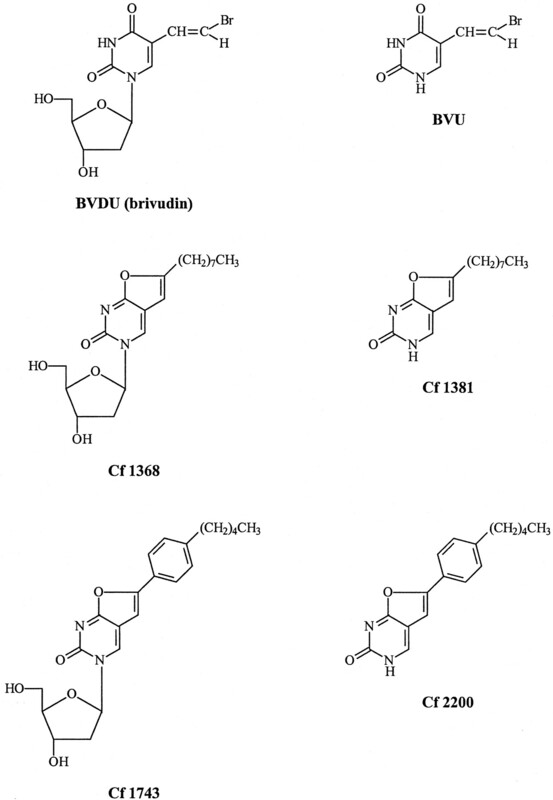 Until the discovery of the BCNAs, the most potent inhibitors of VZV replication in cell culture were (E)-5-(2-bromovinyl)-2′-deoxyuridine [BVDU; brivudine (Zostex)] and (E)-5-(2-bromovinyl)-1-β-d-arabinosyluracil (BVaraU, sorivudine). However, these drugs are not solely active against VZV but also strongly inhibitory to HSV-1 replication (De Clercq et al., 1979; Liermann and Herrmann, 1983; Shigeta et al., 1983;De Clercq, 1984, 1997, 2001; Wassilew et al., 2001). Although very efficacious in the treatment of VZV infections (Wassilew et al., 2001), BVDU is highly susceptible to the hydrolytic activity of human and bacterial thymidine phosphorylase (TPase), whereas BVaraU is resistant to human TPase but sensitive to the catabolic activity of bacterial TPase (Desgranges et al., 1983, 1984; Liermann and Herrmann, 1983). Moreover, the free nucleobase (E)-5-(2-bromovinyl)uracil (BVU) has also proved to be an efficient inhibitor of dihydropyrimidine dehydrogenase (DPD), the key catabolic enzyme in the degradation of pyrimidine nucleosides (Desgranges et al., 1986). The latter property underlies the severe toxicity that led to a number of deaths of persons who were exposed to the anticancer drug 5-fluorouracil (FU) in combination with orally administered sorivudine (Okuda et al., 1998). Apparently, degradation of sorivudine by intestinal prokaryotic (enterobacterial) TPases had released BVU, which then blocked the catabolism of FU by DPD. Consequently, FU reached unacceptably high plasma levels, resulting in death of some of the patients. As a result, clinical trials with sorivudine were suspended (Nakayama et al., 1997;Diasio, 1998; Okuda et al., 1998; Ogura et al., 1998). Given the critical role of TPase and DPD in the metabolism and potential side effects of pyrimidine nucleoside analogs, it was important to investigate whether such undesired effects may be expected for the novel class of BCNAs. Therefore, we examined in this study the susceptibility of the BCNAs to (human and bacterial) TPase and (human) DPD. We found that, in contrast to BVDU and BVaraU, the BCNAs did not display any affinity for human and Escherichia coli TPase and human DPD, which may give them a therapeutic advantage in the clinical setting. The BCNAs Cf 1368 and Cf 1743 were synthesized as described by McGuigan et al. (1999, 2000). Thymidine (dThd) and thymine (Thy) were obtained from Sigma Chemical Co. (St. Louis, MO). (E)-5-(2-Bromovinyl)-2′-deoxyuridine (BVDU) was from the Rega Institute, and (E)-5-(2-bromovinyl)uracil (BVU) and 5-fluorouracil (FU) were from Sigma. [4-14C]Thymine (1.85–2.22 GBq/mmol) was from Moravek Biochemicals (Brea, CA). The structural formulae of the test compounds are depicted in Fig. 1. The synthesis of the free base Cf 2200 was as follows: to a stirred solution of 5-iodouracil (1.0 g, 4.2 mmol) in dry dimethylformamide (10 ml) at room temperature, under a nitrogen atmosphere, was addedp-pentyl-phenylacetylene (2.17 g, 12.6 mmol), diisopropylethylamine (1.5 ml, 8.4 mmol), tetrakis [(triphenylphosphine)palladium(0) (485 mg, 0.42 mmol)], and copper(I) iodide (160 mg, 0.84 mmol). The reaction mixture was stirred at room temperature for 19 h, and copper(I) iodide (160 mg, 0.84 mmol) and triethylamine (10 ml) were then added; and the mixture was subsequently refluxed for 4 h. The reaction mixture was then concentrated in vacuo, and the resulting residue was triturated with methanol and filtered. The resulting yellow solid was further purified by crystallization from dimethyl sulfoxide, yielding the pure product as a white solid (401 mg, 34%). 1H-NMR (d6-dimethyl sulfoxide; 300 MHz): 11.98 (1H, bs, NH), 8.32 (1H, s, H-4) 7.71 (2H, Ha)–7.29 (2H, Hb) (AB system, J = 7.5 Hz), 7.04 (1H, s, H-5), 2.61 (2H, t, J = 7.4 Hz, a-CH2), 1.60 (2H, m, CH2), 1.28 (4H, m, 2 × CH2), 0.86 (3H, t, J = 7.2 Hz, CH3). Structural formulae of anti-VZV compounds and their free bases. Enzyme Expression, Isolation, and Purification. The E. coli TPase gene was isolated from genomic DNA of E. coli K12 and subcloned in the pGEM-T vector (Promega, Madison, WI). The forward (5′-AAG AAT TCT TTC TCG CAC AAG AAA TTA TTC G) and reverse (5′-AAG TCG ACT TAT TCG CTG ATA CGG CG) primers (Invitrogen, Paisley, UK) were used to introduce an EcoRI and aSalI site, respectively. The bacterial TPase gene was subsequently cloned between the EcoRI and SalI sites of the pGEX-5X-1 vector (Amersham Biosciences AB, Uppsala, Sweden). The resulting plasmid vector (pGEX-5X-1-TP) was checked by automated fluorescence sequencing (ALFexpress; Amersham Biosciences) and transduced into E. coli BL21(DE3)pLysS. The plasmid vector containing the human TPase (platelet-derived endothelial cell growth factor) gene (pMOAL10X), kindly provided by Dr. Roy Bicknell (Oxford, UK) (Moghaddam and Bicknell, 1992), was transfected into E. coli BL21(DE3)pLysS. The E. coli and human TPase genes were expressed in E. coli as glutathione S-transferase (GST) fusion proteins, as follows. Bacteria were grown overnight at 37°C in 2-yeast/tryptone medium containing ampicillin (100 μg/ml) and chloramphenicol (40 μg/ml), and then diluted 1:10 in fresh medium. After further growth of the bacteria at 27°C (for 1 h), isopropyl-β-d-thiogalactopyranoside (Sigma) was added to a final concentration of 0.1 mM to induce the production of the GST-TPase fusion protein. After further growth for 15 h at 27°C, cells were pelleted (6,000g for 10 min at 4°C) and resuspended in lysis buffer [50 mM Tris, pH 7.5, 1 mM dithiothreitol, 5 mM EDTA, 10% glycerol, 1% Triton X-100, 0.1 mM phenylmethylsulfonyl fluoride, and 0.15 mg/ml lysozyme]. Bacterial suspensions were homogenized and lysed by means of a French Pressure cell press (SLM-Aminco; Beun-De Ronde B. V., La-Abcoude, The Netherlands) and ultracentrifuged (20,000g for 15 min at 4°C). GST-TPase was purified from the supernatant using glutathione-Sepharose 4B (Amersham Biosciences) as described by the supplier. Briefly, a 50% slurry of glutathione-Sepharose was added to the bacterial supernatant (1.5 ml/1.5 liters of broth), incubated for 30 min at 4°C, and then washed three times with 10 bed volumes (7.5 ml) of lysis buffer without lysozyme and phenylmethylsulfonyl fluoride. Bound proteins were eluted in 50 mM Tris (pH 8.0) containing 0.1% Triton X-100 and 10 mM glutathione. Protein content of the purified fractions was assessed using Bradford reagent (Sigma). The phosphorolysis of thymidine and the anti-VZV compounds by human TPase and E. coli TPase was measured by HPLC analysis. The incubation mixture (500 μl) contained 10 mM Tris-HCl, pH 7.6, 1 mM EDTA, 2 mM potassium phosphate, 150 mM NaCl, and 100 μM dThd, BVDU, Cf 1368, or Cf 1743 and 0.3 unit of human TPase or 1.5 units of E. coli TPase. One unit was defined as the amount of enzyme that catalyzed the conversion of 1 μmol of thymidine to thymine per minute at pH 7.4 and 25°C. All incubations were performed at room temperature. At different time points (i.e., 0, 5, 30, and 120 min), 100-μl fractions were withdrawn, transferred to an Eppendorf tube thermo block, and heated at 95°C for 5 min. Thereafter, the samples were rapidly cooled on ice, and the nucleosides were separated from their bases and quantified in the samples on a reverse-phase RP-8 [MicroCard 125–4 RP-select B (5 μm)] column (Merck, Darmstadt, Germany) by HPLC analysis. The separation for dThd and BVDU and their respective bases was performed by a linear gradient from 98% buffer B (1 mM potassium phosphate buffer, pH 5.5) + 2% buffer C (1 mM potassium phosphate buffer, pH 5.5 + 80% methanol) to 20% buffer B + 80% buffer C. After injection of the samples, 98% buffer B + 2% buffer C was run for 10 min before the start of the gradient (5 min from 2 to 80% buffer C). The retention times of Thy, BVU, dThd, and BVDU were 4.2, 19.5, 9.0, and 20.6 min, respectively. UV-based detection of Thy and dThd was performed at 262 nm, and of BVU and BVDU at 295 nm. The separation of the BCNAs and their respective bases was performed by a linear gradient from 98% buffer B (50 mM NaH2PO4 + 5 mM heptane sulfonic acid, pH 3.2) + 2% buffer C (acetonitrile) to 20% buffer B + 80% buffer C. After injection of the samples, 98% buffer B + 2% buffer C was run for 2 min before the start of the gradient (6 min from 2% buffer C to 20% buffer C) followed by 22 min from 20% buffer C to 80% buffer C and 5 min isocratic flow at 80% buffer C. The retention times of Cf 2200, Cf 1381, Cf 1368, and Cf 1743 were 23.6, 23.1, 22.0, and 22.6 min, respectively. Detection of the BCNAs was based on their fluorescent properties (excitation at 330 nm and emission at 420 nm). In the assays evaluating the inhibitory effect of the BCNAs, 100 μM and 0 μM (control) BCNAs Cf 1368 and Cf 1743 were added to the reaction mixture (500 μl) containing 100 μM dThd. Aliquots of 100 μl were withdrawn from the reaction mixtures at several time points, as described above, heated at 95°C to inactivate the enzyme, and analyzed on HPLC for quantification of the conversion of dThd to Thy. The full-atom model ofE. coli TPase was kindly provided by Dr. S. Ealick (Cornell University, Ithaca, NY), and Cf 1743 was modeled into the active site based on the position of Thy inferred by Walter et al. (1990). Human peripheral blood mononuclear cells were isolated from 15 ml of EDTA-anticoagulated blood by centrifugation in LeucoSep tubes (Greiner, Frickenhausen, Germany) over Lymphoprep (specific gravity 1.077 g/ml, 280 mOsm) (Nycomed Pharma AS, Oslo, Norway), and the cells from the interface were collected and treated with ice-cold NH4Cl to lyse the contaminating erythrocytes, as described previously (Van Kuilenburg et al., 2000). The activity of DPD was determined in a reaction mixture containing 35 mM potassium phosphate, pH 7.4, 2.5 mM MgCl2, 1 mM dithiothreitol, 250 μM NADPH2, and 25 μM [4-14C]thymine. Separation of radiolabeled thymine from radiolabeled dihydrothymine was performed isocratically [50 mM NaH2PO4, pH 4.5, at a flow rate of 2 ml/min] by HPLC on a reversed-phase column (Alltima C18, 250 × 4.6 mm, 5-μl particle size; Alltech Associates, Deerfield, IL) and protected by a guard column (Supelguard LC-18-S, 5-μm particle size, 20 × 4.5 mm; Supelco, Bellefonte, PA) with online detection of the radioactivity, as described before (Van Kuilenberg et al., 2000). Protein concentrations were determined with a copper-reduction method using bicinchoninic acid, essentially as described by Smith et al. (1985). 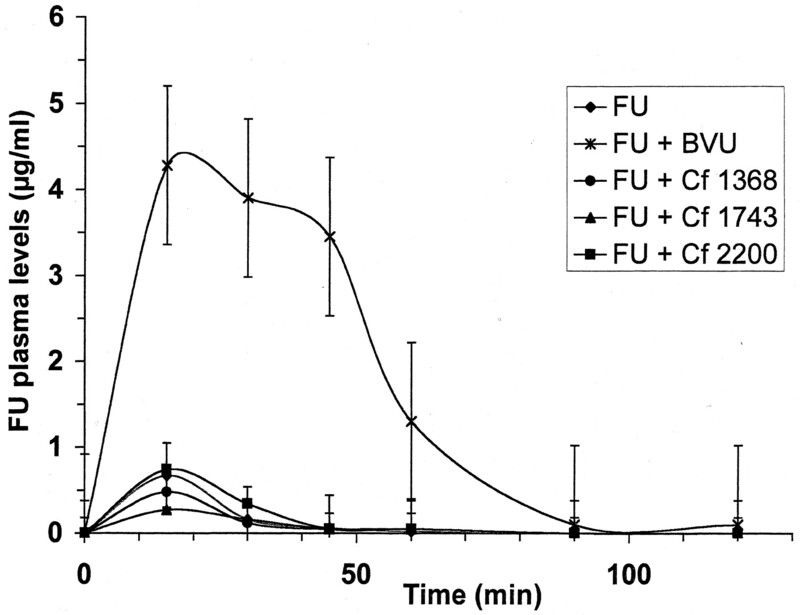 Pharmacokinetics of FU in Mice in the Presence of BVDU, BVU, Cf 1368, Cf 1743, and Cf 2200. NMRI mice weighing ∼16 to 20 g were injected intraperitoneally with BVU (20 mg/kg), BVDU (30 mg/kg), Cf 1368 (30 mg/kg), Cf 1743 (20 mg/kg), or Cf 2200 (30 mg/kg) at 1 h before the (intraperitoneal) administration of FU (20 mg/kg). Blood was collected in heparinized tubes from the drug-treated animals at 0, 15, 30, 45, 60, 90, and 120 min after FU administration. The blood was centrifuged and the plasma was extracted with 66% ice-cold methanol. After centrifugation (13,000 rpm, 10 min at 4°C), the plasma extracts were evaporated and resuspended in buffer (10 mM potassium phosphate buffer, pH 5.5) before analysis on an HPLC C-18 reverse-phase column (LiChroCart 250–4 RP-18; Merck) to determine the drug plasma levels. FU, BVU, and BVDU were separated using the following gradient: from 0 to 10 min: 100% buffer B (50 mM NaH2PO4 + 5 mM heptane sulfonic acid, pH 3.2); from 10 to 15 min: linear gradient to 70% buffer B + 30% buffer C (methanol); from 15 to 25 min: isocratic flow at 70% buffer B + 30% buffer C; from 25 to 35 min: linear gradient to 100% buffer B. Retention times of BVDU, BVU, and FU were 28.3, 26.0, and 5.2 min, respectively. FU, Cf 1368, and Cf 1743 were separated using the same gradient, but methanol (buffer C) was replaced by acetonitrile. Retention times of Cf 1368, Cf 1743, Cf 2200, and FU were 24.5, 25.0, 25.6, and 5.2 min, respectively. Antiviral Activity of BVDU and the BCNAs. When evaluated for their inhibitory activity against varicella-zoster virus (strain OKA) replication in human embryonic lung fibroblast cell cultures, BVDU and the BCNAs Cf 1368 and Cf 1743 showed 50% effective concentrations (EC50) of 0.003, 0.008, and 0.0003 μM, respectively. Under similar experimental conditions, acyclovir was inhibitory at an EC50 of 2.9 μM (McGuigan et al., 1999, 2000). 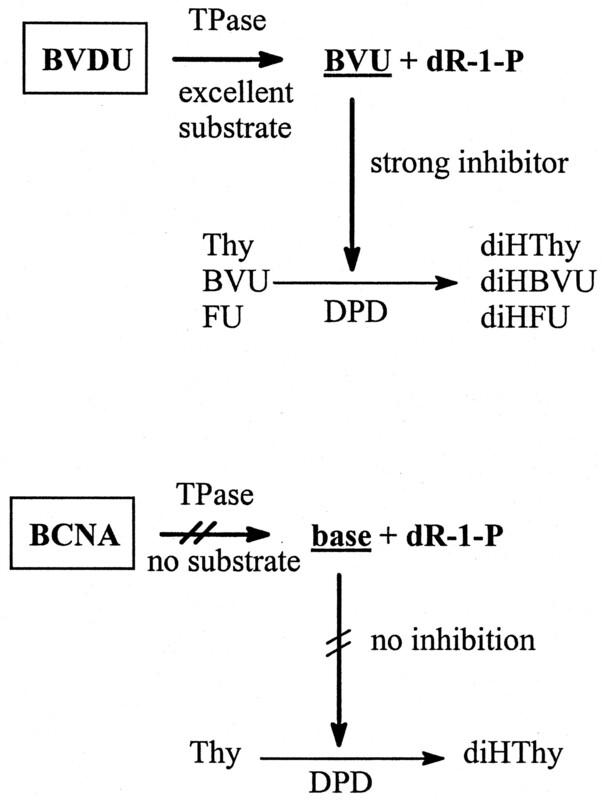 Inhibitory Effects of BCNAs and BVDU on Human TPase. Recombinant human TPase was expressed, produced, and purified as described under Materials and Methods. In a first set of experiments, human TPase was added to a reaction mixture containing a 100 μM concentration of the natural substrate dThd and 100 μM concentrations of the BCNAs Cf 1368 or Cf 1743, or 500 or 100 μM BVDU. The amount of enzyme was adjusted to convert ∼ 50% of the substrate dThd to thymine and 2-deoxyribose-1-phosphate (dR-1-P) within 20 to 30 min. Under these experimental conditions, no inhibition of the TPase reaction by either Cf 1368 or Cf 1743 was detected (Fig.2). 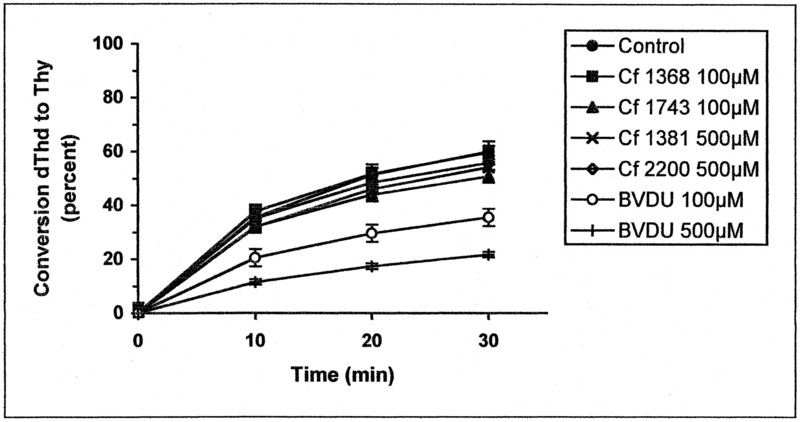 In contrast, the antiherpetic drug BVDU markedly slowed down the hydrolytic reaction, presumably by competing with dThd as an alternative substrate for TPase (Fig. 2). 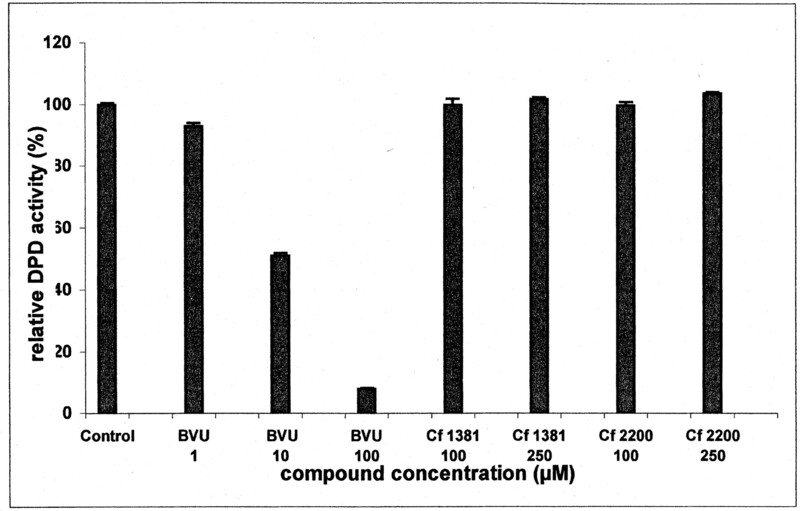 Indeed, whereas no traces of free base Cf 1368 and Cf 1743 were detected in the reaction mixture after 30 min of incubation, a marked amount of (E)-5-(2-bromovinyl)uracil (BVU) derived from BVDU was formed in the reaction mixture (data not shown), concomitantly with a diminished conversion of thymidine to thymine (Fig. 2). Inhibitory effects of Cf 1368, Cf 1743, Cf 1381, Cf 2200, and BVDU on human TPase with thymidine as the natural substrate. Data are the mean (±S.D.) of two to three independent experiments. Substrate Activity of BCNAs and BVDU for Human and E. coli TPase. In a second set of experiments, the natural substrate dThd was replaced by Cf 1368, Cf 1743, and BVDU to enable direct measurement of substrate activity of the drugs for both human and E. coli TPase. High amounts of TPase were added to the reaction mixture to convert ∼75 to 80% of dThd to thymine and dR-1-P within 5 min; that is, at equilibrium between the forward and reverse reaction (Fig. 3). Whereas, in the presence of human TPase, BVDU conversion to its free base BVU occurred as fast as, if not faster than, the conversion of dThd to thymine, no traces of free base were released from Cf 1368 and Cf 1743 after 120 min, which is at least a 25-fold longer incubation period than required to maximally convert dThd and BVDU to their corresponding bases (Fig.3A). In the presence of high amounts of E. coli TPase, which converted dThd to thymine + dR-1-P at equilibrium within 5 min of substrate exposure to the enzyme, BVDU was converted to BVU at a much slower pace, reaching an equilibrium (75–80% conversion of BVDU to BVU) after 120 min. In contrast, no evidence of hydrolysis of Cf 1368 and Cf 1743 to their free base was found within the same incubation period (Fig. 3B). Substrate activity of BVDU, dThd, Cf 1368, and Cf 1743 for human (A) and E. coli (B) TPase. Data are the mean (±S.D.) of two to three independent experiments. Molecular Modeling of Cf 1743 in the Active Site of E. coli TPase. The thymidine binding in the active site cleft of E. coli TPase shown in Fig.4 was derived from the crystal structure of the thymine/TPase complex resolved by Walter et al. (1990). In the enzyme/substrate complex, several atoms in the thymine molecule make extensive H-bonding with several amino acids in the active site. The carbonyl oxygen at C-2 of the thymine ring forms a hydrogen bridge with the ε-NH2 of Lys190, the N-3 imino group hydrogen bonds with the hydroxyl of Ser186, and the carbonyl oxygen atom at C-4 accepts a hydrogen bridge from Arg 171. In addition, interactions of Lys190 and Ser186 with Asp164 further stabilize the positioning of the amino acids and thymine in the active site. E. coli dThd phosphorylase with dThd (A) and Cf 1743 (B) modeled into the active site. The thymidine binding in the active site cleft of E. coli thymidine phosphorylase was from the structure by Walter et al. (1990). Protein atoms are shown as a gray ball-and-stick model surrounded by a semitransparent van der Waals surface. Based on the inferred binding mode for thymine (Thy) by Walter et al. 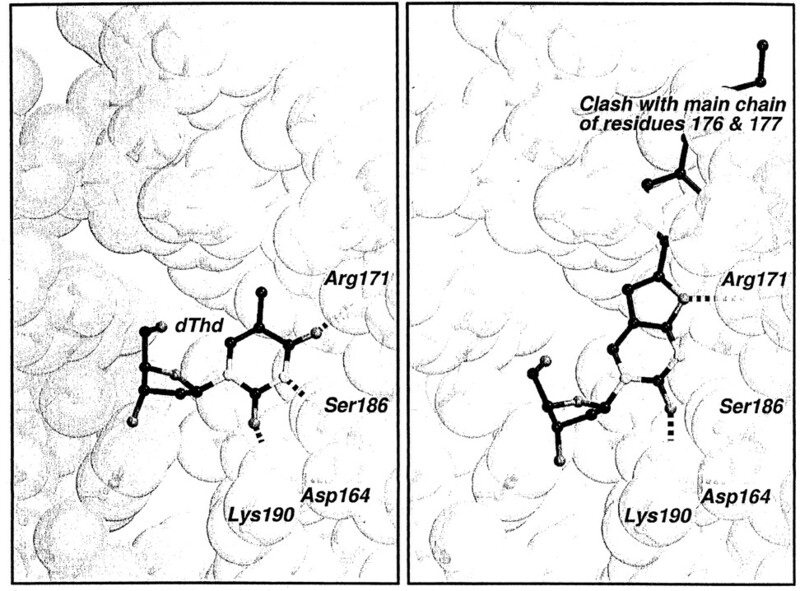 (1990), A shows bound dThd (black) making an extensive network of hydrogen bonds (dashed lines) with TPase, while B shows that the inhibitor (black) could not make such an extensive network of hydrogen bonds and that, more seriously, the p-pentyl-phenyl moiety clashes with part of the amino acids (main chain) in the active site cleft. Figures were drawn with BobScript (Esnouf, 1999) and rendered with Raster3D. In an attempt to model the BCNA Cf 1743 into the active site of TPase, we tried to position as close as possible the carbonyl at C-2, the N-3, and the oxygen connected to C-4 in the BCNA to the position of the corresponding atoms in thymine. Although we were able to reasonably position the fused ring of the BCNA in the active site of TPase (forming two hydrogens between the pyrimidine ring and Lys190 and Arg171), Ser186 could not accept a hydrogen bridge from the bicyclic ring, because the nitrogen that corresponds to N-3 in thymine now becomes a H acceptor instead of a H donor due to the fused ring system (see also structure in Fig. 1). The lack of such a third H-bridge between the active site amino acids and the drug would by itself destabilize the BCNA/TPase complex. However, the alkylphenyl ring connected to the C-6 position of the fused ring system could not be fitted in the enzyme without serious steric hindrance and direct clash with the main chain of residues 176 and 177 of TPase (Fig. 4). Therefore, we infer that the TPase has no space available in its active site to reasonably accommodate the BCNA Cf 1743 to afford optimal positioning of this drug for hydrolysis to the free base. Inhibitory Effects of BCNA Free Base Cf 1381 and Cf 2200, and BVU on Human DPD. Human DPD from peripheral blood mononuclear cells was exposed to Cf 1381 (the free base of Cf 1368), Cf 2200 (the free base of Cf 1743), or BVU (the free base of BVDU) at 10, 100, and 250 μM in the presence of radiolabeled substrate (thymine). Whereas BVU potently inhibited the reduction of thymine to 5,6-dihydrothymine at 100 μM, and showed an IC50 value against the enzyme of ∼10 μM, no sign of inhibition was noted for Cf 1381 and Cf 2200 at 100 and 250 μM (Fig. 5). It could be concluded that, in contrast with BVU, the BCNA free bases were not efficiently recognized by DPD and, therefore, did not measurably influence the catalytic activity of the enzyme. Inhibitory effects of BVU and Cf 1381 on human DPD. Data are the mean of a duplicate experiment. Effects of BVDU, BVU, Cf 1743, Cf 1368, and Cf 2200 on FU Levels in Mice. To ascertain that the BCNAs did not affect DPD activity in the in vivo setting, BVDU (20 mg/kg) and BVU (20 mg/kg) (included as positive controls), and the BCNAs Cf 1368 (30 mg/kg) and Cf 1743 (20 mg/kg), and Cf 2200 (30 mg/kg) (free base of Cf 1743) were administered to adult NMRI mice 1 h before 20 mg/kg FU administration, and FU levels in plasma were recorded at different time points. Both BVDU (data not shown) and BVU (Fig. 6) had a strong impact on the FU plasma levels. Compared with control mice that only received FU, prior administration of BVDU and BVU afforded a marked and extended raise of the FU plasma levels. FU also remained for a much longer time in plasma after prior administration of BVU than in the control mice (treated with FU only) (Fig. 6). In contrast, neither Cf 1368 nor Cf 1743, nor the free base Cf 2200 was able to raise or extend the FU levels in the plasma. Effect of BVU (20 mg/kg), Cf 1368 (30 mg/kg), Cf 1743 (20 mg/kg), and Cf 2200 (30 mg/kg) on FU plasma levels in adult NMRI mice. Data are the mean (±S.D.) of two to three independent experiments, except for data of FU + Cf 2200 and FU that were derived from one experiment. The BCNAs represent an entirely novel class of antivirals with an unprecedented antiviral activity (in the picomolar concentration range) and antiviral selectivity (solely varicella-zoster virus). The compounds are characterized by the presence of a fused bicyclic pyrimidine ring containing a bulky lipophilic aliphatic/aromatic moiety, the presence of which is a prerequisite for antiviral activity (McGuigan et al., 1999, 2000; Balzarini and McGuigan, 2002a,b). We have recently shown that the compounds are activated (i.e., phosphorylated) by the VZV-encoded thymidine kinase (TK). Because the closely related herpes simplex virus TK does not recognize the BCNAs as a substrate, the viral specificity could be explained, at least in part, by a selective metabolic discrimination at the level of activation by VZV TK. This is in striking contrast to BVDU, a closely related nucleoside analog that is phosphorylated by both HSV-1 TK and VZV TK, and has potent activity against both viruses (Shigeta et al., 1983; De Clercq, 1997). However, BVDU is readily hydrolyzed by human and bacterial TPase to its antivirally inactive free base BVU. In addition, BVU has been shown to be a potent inhibitor of DPD, thus preventing its own catabolism to 5,6-dihydro-BVU and, more importantly, also preventing the catabolism of other pyrimidine bases such as FU. This property has resulted in increased toxic side effects during oral BVaraU (sorivudine) treatment of VZV infections in FU-treated patients. In these patients, release of BVU by intestinal bacterial TPase led to uncontrolled rises in plasma FU levels, resulting in a number of deaths. It was, therefore, of crucial importance to elucidate whether the BCNAs are a substrate for human and bacterial TPase and whether the BCNA free bases may act as inhibitors of DPD. In this study, we have convincingly shown that the BCNAs are not inhibitory to TPase and are not recognized as a substrate by either human or E. coli TPase at drug concentrations that exceed more than 100,000-fold the concentrations needed for anti-VZV activity in cell culture. These findings were further corroborated by our inability to model the BCNAs in the active site of E. coli TPase using the coordinates of the enzyme/thymine complex published by Walter et al. (1990). Whereas it was possible to fit the fused ring and deoxyribose moiety of BCNA in the enzyme active site, the bulky lipophilic pentylphenyl moiety linked to C-6 of the bicyclic pyrimidine ring clashed with the main chain of amino acid residues 176 and 177. In addition, and in contrast with thymine, BCNA is unable to form a third hydrogen bridge between the N-3 nitrogen in the pyrimidine ring and Ser186, further contributing to a suboptimal fit of the compound in the TPase active site. When the free base of the BCNA Cf 1743 was examined for its inhibitory effect against human DPD at concentrations that exceeded those required for anti-VZV activity of Cf 1743 by at least 5 to 6 orders of magnitude, no inhibition of the enzyme activity was observed using thymine as the natural substrate under conditions where BVU efficiently blocked DPD activity. These data are also in full agreement with our findings that neither the BCNAs Cf 1368 and Cf 1743 nor the free base Cf 2200 had any effect on FU plasma levels in FU-treated mice. These findings indicate that neither the BCNAs nor their free bases may be expected to interfere with the catabolic enzymatic activity of DPD. The unusual high specificity and selectivity of the BCNAs as anti-VZV agents may explain the lack of a measurable cytostatic activity in human embryonic lung fibroblast cell cultures at concentrations that exceed 4 to 6 orders of magnitude their antiviral potency, and also the lack of acute toxicity in mice when administered at an oral dose of 100 mg/kg, or an intravenous dose of 20 or 30 mg/kg. However, no long-term toxicity studies have been carried out yet. In conclusion, BVDU is an excellent substrate for human and mammalian TPase, and its free base BVU is a potent inhibitor of DPD (Fig.7, summarizing scheme at the top). However, it could be demonstrated that, in sharp contrast with BVDU (and BVU), the novel anti-VZV BCNAs are not susceptible to the inactivating activity of TPase and do not interfere with the catabolism of pyrimidines and pyrimidine analogs such as FU (Fig. 7, summarizing scheme at the bottom). Therefore, BCNAs may be expected not to affect FU plasma levels in patients treated with FU for cancer that would concomitantly be treated with the BCNAs for a concurrent VZV infection. Summary of the catabolic properties of BVDU and the BCNAs Cf 1368 and Cf 1743. Top, BVDU is efficiently converted to its antivirally inactive base BVU by TPase, and BVU is a potent inhibitor of DPD-catalyzed reduction of thymine, uracil, and the anticancer compound 5-fluorouracil. Bottom, the BCNAs are not converted by TPase to their free bases, and the free base is not an inhibitor of DPD-catalyzed conversion of thymine, uracil, and 5-fluorouracil to their corresponding 5,6-dihydrogenated derivatives. We thank C. Callebaut for dedicated editorial assistance. This research was supported by grants from the Geconcerteerde Onderzoeksacties–Vlaanderen (Project 00/12), the Fonds voor Wetenschappelijk Onderzoek–Vlaanderen (Project G-0140-98), and the Belgian Federation against Cancer. R.S. has a fellowship from the IWT (Flemish Institute supporting scientific technological research in industry). Balzarini J and McGuigan C (2002a) Bicyclic pyrimidine nucleoside analogues (BCNAs) as highly selective and potent inhibitors of varicella-zoster virus replication. J Antimicrob Chemother, in press. Balzarini J and McGuigan C (2002b) Chemotherapy of varicella-zoster virus (VZV) by a novel class of highly specific anti-VZV bicyclic pyrimidine nucleosides. Biochim Biophys Acta, in press. (1984) The antiviral spectrum of (E)-5-(2-bromovinyl)-2′-deoxyuridine. J Antimicrob Chemother 14 (Suppl. A) 85–95. (1997) Virus replication: target functions and events for virus-specific inhibitors. in Antiviral Agents and Human Viral Diseases, eds Galasso GJ, Whitley RJ, and Merigan TC (Lippincott-Raven Publishers, Philadelphia), 4th ed, pp 1–44. (2001) Antiviral activity of nucleoside analogues: the BVDU connection. in Recent Advances in Nucleosides: Chemistry and Chemotherapy, ed Chu D (Elsevier Science B. V. New York) , in press. (1979) E-5-(2-Bromovinyl)-2′-deoxyuridine: a potent and selective antiherpes agent. Proc Natl Acad Sci USA 76:2947–2951. (1986) Effect of (E)-5-(2-bromovinyl)uracil on the catabolism and antitumor activity of 5-fluorouracil in rats and leukemic mice. Cancer Res 46:1094–1101. (1984) Regeneration of the antiviral drug (E)-5-(2-bromovinyl)-2′-deoxyuridine in vivo. Nucleic Acids Res 12:2081–2090. (1983) Phosphorolysis of (E)-5-(2-bromovinyl)-2′-deoxyuridine (BVDU) and other 5-substituted 2′-deoxyuridines by purified human thymidine phosphorylase and intact blood platelets. Biochem Pharmacol 32:3583–3590. (1998) Sorivudine and 5-fluorouracil: a clinically significant drug-drug interaction due to inhibition of dihydropyrimidine dehydrogenase. Br J Clin Pharmacol 46:1–4. (1999) Further additions to MolScript version 1.4, including reading and contouring of the electron-density maps. Acta Crystallogr Sect D Biol Crystallogr 55:938–940. (1983) (E)-5-(2-Bromovinyl)-2′-deoxyuridine. A good substrate for mammalian pyrimidine nucleoside phosphorylases. Biomed Biochim Acta 42:K35–K38. (2000) Highly potent and selective inhibition of varicella-zoster virus by bicyclic furopyrimidine nucleosides bearing an aryl side chain. J Med Chem 43:4993–4997. (1999) Potent and selective inhibition of varicella-zoster virus (VZV) by nucleoside analogues with an unusual bicyclic base. J Med Chem 42:4479–4484. 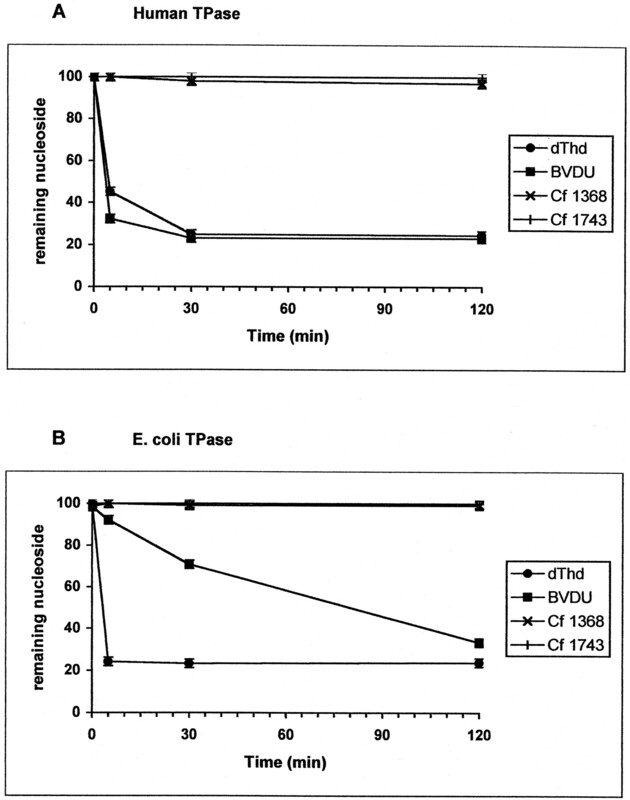 (1992) Expression of platelet-derived endothelial cell growth factor in Escherichia coli and conformation of its thymidine phosphorylase activity. Biochemistry 31:12141–12146. (1997) Intestinal anaerobic bacteria hydrolyse sorivudine, producing the high blood concentration of 5-(E)-(2-bromovinyl)uracil that increases the level and toxicity of 5-fluorouracil. Pharmacogenetics 7:5–43. (1998) Suicidal inactivation of human dihydropyrimidine dehydrogenase by (E)-5-(2-bromovinyl)uracil derived from the antiviral, sorivudine. Cancer Lett 122:107–113. (1998) A possible mechanism of eighteen patient deaths caused by interactions of sorivudine, a new antiviral drug, with oral 5-fluorouracil prodrugs. J Pharmacol Exp Ther 287:791–799. (1983) Comparative efficacy of antiherpes drugs against various strains of varicella-zoster virus. J Infect Dis 147:576–584. (2000) Pitfalls in the diagnosis of patients with a partial dihydropyrimidine dehydrogenase deficiency. Clin Chem 46:9–17. (1990) Three-dimensional structure of thymidine phosphorylase from Escherichia coli at 2.8 Å resolution. J Biol Chem 265:14016–14022. (2001) Brivudin compared to acyclovir and famciclovir: effect on zoster-associated pain. Abstracts of the Fourteenth International Conference on Antiviral Research, Seattle, WA, April 8–12, 2001. Antiviral Res 50:A90, , abstract 180.